This is a review of Visual Pak’s ApHogee Nutritional Supplement for Healthy Hair. The company’s product claims to aid in the growth of natural, healthy hair. They also suggest that this product can improve the quality and density of your hair, in addition to aiding new growth in areas suffering from hair loss. Visual Pak also claims that their ApHogee Nutritional Supplement for Healthy Hair can stave off the loss of hair color that comes with age, and help return hair follicles to full-effectiveness. Read on to find out more about this system and find out if it’s the right product for you. Per Visual Pak’s website, individuals are to take one pill with a meal, daily. Upon critical examination of the company’s home page, no mention was made as to the time frame necessary to see results from the ApHogee Nutritional Supplement for Healthy Hair. This product can be used by both men and women, although it is not recommended for individuals under the age of 18. It is recommended that any individual should consult with a physician before starting a new vitamin regimen. From the information Visual Pak provides, it seems as though the ApHogee Nutritional Supplement for Healthy Hair may not contain high enough levels of their active compounds (most notably Niacin and Biotin) to have a noticeable impact on the human body, although it should be said that their vitamin contains several extracts that may strengthen their effectiveness (but this could not be confirmed). A single order of Visual Pak’s ApHogee Nutritional Supplement for Healthy Hair costs between $9.65 and $12.95 through secondary seller sites, and contains enough product for a 1 month supply. 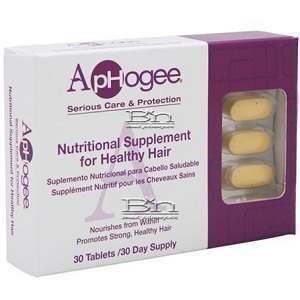 The ApHogee Nutritional Supplement for Healthy Hair is not sold directly from the manufacturer, and Visual Pak offers no discounts or subscription services for their product. Visual Pak offers no guarantee on their ApHogee Nutritional Supplement for Healthy Hair. Return rates through secondary sellers vary in price or aren’t offered at all. Visual Pak’s ApHogee Nutritional Supplement for Healthy Hair seems to be a slightly below-average product for the standard consumer. On the plus side, the price is quite reasonable for a 30-day supply. Also comforting is that a large percentage of the customer reviews were found to be exceedingly positive, and claimed the desired effects. Unfortunately, while the vitamins do contain several ingredients that are known to aid in hair restoration, they don’t seem to be included at high enough levels for individuals to see the desired effects. John Brownstone	reviewed Visual Pak ApHogee	on June 28th	 and gave it a rating of 2.5.